New website design for local farm with pitches for caravan statics. Collin Pit Farm is a working sheep farm in the Rusland Valley in the Lake District National Park. They have a caravan site offering a limited number of static pitches with fantastic views to Grizedale and Helvellyn. The site is in a quiet and peaceful part of the southern Lake District between the southern tips of Coniston Water and Lake Windermere. 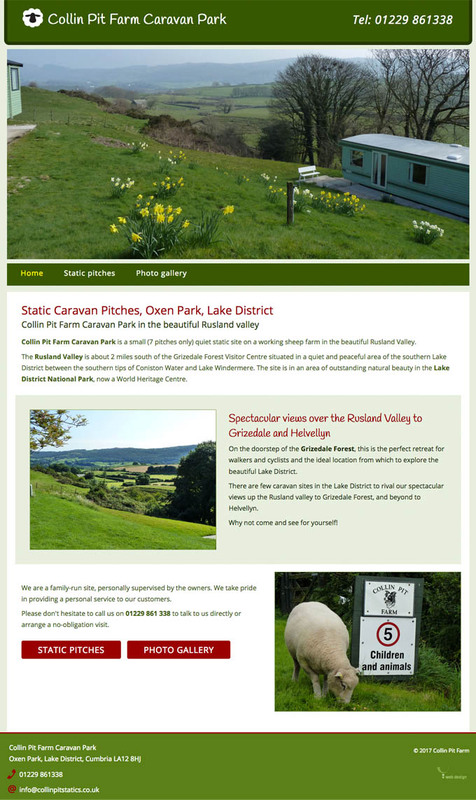 The client required a simple site to advertise their caravan site and any vacant pitches. As they are a small site they rarely have vacant pitches.